By Olivier Bault. Article originally published in French on Réinformation TV. The European spruce bark beetle is a beetle that colonizes the spruce forests, a very common tree in the beautiful forest of Białowieża, North-East Poland. Ecologists consider it a primeval forest that must not be touched, while forest services and inhabitants speak of a natural forest, since man has been there for centuries even though his interferences have always been limited. For foresters, the spruce bark beetle is not a problem in itself, but the current wave of colonization by this destructive spruce insect is the largest in nearly a century. The most effective means of control is to cut and evacuate dead or infected trees, because this beetle is able to kill a tree in one month and for one killed tree, about thirty others can get infected because of it. Until 2011, the Forest Services of Białowieża explained that they had no problem managing the problem of the European spruce bark beetle. It was the coming into force of the new forest management plan in 2012, under the government of Donald Tusk, that changed everything. Under the pressure of environmental NGOs, the Ministry of the Environment has drastically reduced the amount of trees that could be cut down and extended the protected areas from where it became forbidden to evacuate the infected trees. To top it all off, the Białowieża Forest is on the list of Natura 2000 Special Protection Areas (SPAs) of Community interest, and the European Commission therefore considers itself entitled to intervene in order to prevent any tree cutting as ecologists have been asking for since 2007. It was in 2007 that a local forest ranger identified 29 spruce trees infected by the European spruce bark beetle and asked the Regional Conservator of Nature for permission to have them cut down and evacuated quickly. A request that was opposed by the local branch of an organization of nice ecologists defending the right to life of beetles. Their opposition lasted so long that in 2009 there were not anymore 29 infected trees but 2.656. In 2014, the Białowieża forest was included in the UNESCO World Heritage List. In April 2017, the infected trees counted were about …. 834 000, or about 8% of the trees in the Białowieża forest. It is one million cubic meters of infected wood for just over 160,000 cubic meters of wood evacuated due to legal restrictions. The origin of the current invasion and the responsibility of the ecologists is described here on a site also deeply hostile to the PiS government. 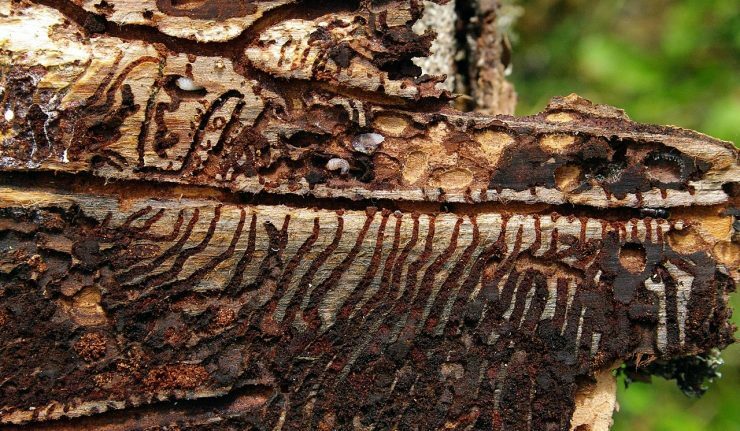 The current Ministry of the Environment, Jan Szyszko (PiS), is in favor, as inhabitants and foresters, of an increased cutting policy in order to stem the growth of the European spruce bark beetle, otherwise the Białowieża forest risks to turn into a steppe for very long years. Ecologists and the European Commission, on the other hand, demand the stopping of all cuts that are not motivated by the concern for the safety of walkers (roadsides trees). The European Commission has even brought the case before the EU Court of Justice, which has provisionally banned, pending a decision on the merits of the case, any “active forest management” and therefore any cutting and evacuation of trees except “to ensure public safety”. The European spruce bark beetle therefore continues to proliferate in the Białowieża forest. The importance of the invasion means that even young trees are affected. Before the judgment of the Court of Justice, since the arrival of the PiS in power, the ecologists multiplied the actions to prevent the cuts while the inhabitants organized counter-demonstrations to demand that one saves their forest. The European Parliament also took up the issue in its catch-all resolution of 15 November on the state of the rule of law and democracy in Poland “to put an end to the large-scale wood exploitation in the forest of Białowieża”. By using these words, the MEPs have once again demonstrated their profound ignorance, which is also very natural, of local problems. The ecologists give as an example the forest of Bavaria, Germany, which undergoes the same type of invasion of the European spruce bark beetle and where the authorities decided not to intervene. Except that to allow young trees to grow on lands devastated by the beetle, the Germans are now obliged to kill deers, explain the Polish foresters, and their forest therefore does not grow back more naturally than if they had cut down and evacuated the infected trees, it just takes longer to regenerate. Minister Jan Szyszko, who holds the title of Professor of Forest Science, organized an international scientific conference on the 4th of December in Warsaw, dedicated to the management of the invasion of European spruce bark beetles. The problem is that the EU Court of Justice has imposed a penalty of € 100,000 per day in case of tree cutting in the Białowieża forest. With no consideration for the opinion of the experts in the matter, it is therefore in Brussels and Luxembourg that the future of this jewel of nature will be decided. Unlike the government of Beata Szydło and his Minister of the Environment, the Brussels Commissioners and the Luxembourg judges, who are not in the best position to make the right decisions about the Białowieża forest, will not have to account to Polish voters if their action causes irreparable damages. Stupidity of EU elites in Brussels has no measure. Polish forest experts know best what is needed to save the Bialowieza forest. They have done it for centuries, since that primeval forest is a national treasure of Poland not EU!!! 1. The “source”: Réinformation TV… Could as well have been called Revisionist. 2. Ecologists “consider it a primeval forest”: it IS a primeval forest, by scientific accounts; primeval does not mean devoid of all human activities. 3. The “European Commission therefore considers itself entitled to intervene”: given its status of Special Protection Area under the relevant EU-directives, it IS – once again – entitled to intervene to insure compliance with EU-law. Please revise your basics. 4. Due to its importance for the Union as resulting of its legal status, his forest and its management is not a “local problem” as you misleadingly state.